Gifted Pathways is SAGE’s 3rd annual “mini-conference” to help you navigate your gifted child or student from kindergarten to college. Sessions are planned for parents, educators and gifted students. 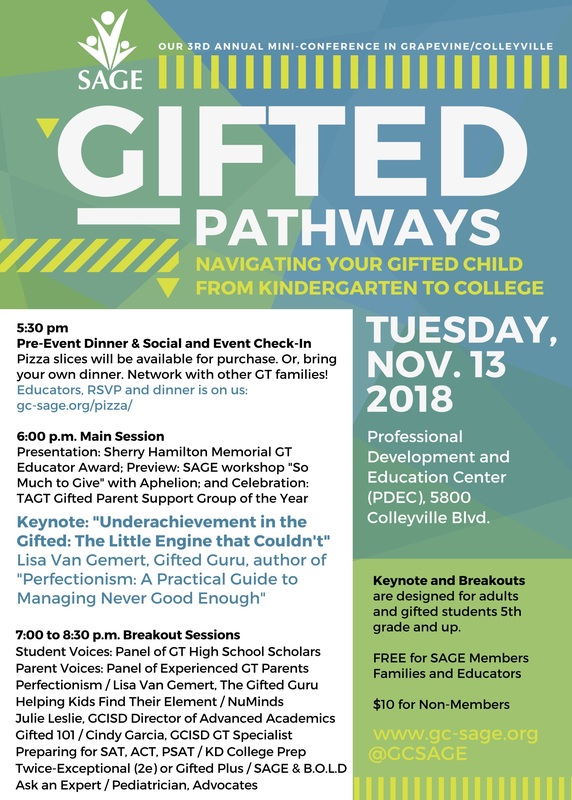 Tuesday, November 13, 2018 at GCISD’s Professional Development and Education Center (PDEC), 5800 Colleyville Blvd. Pizza slices will be available for purchase. Or, bring your own dinner. Network with other GT families! Check in for students pre-registered for the Kids’ Workshop begins about 5:45 in the Mustang Room. Lisa is an engaging keynote speaker and winner of the 2018 TAGT Legacy Book Award for her book on gifted perfectionism. Her appearance locally with SAGE is booked between her appearances at the National Association for Gifted Children and the Texas Association for the Gifted and Talented conferences. Don’t miss this opportunity to hear the Gifted Guru right here in town! Perfectionism, with Lisa Van Gemert, The Gifted Guru. A bonus session with our keynote speaker. Student Voices: A panel of current GT high schoolers will reflect on their middle school experiences and offer advice to students. Great for 5th-12th graders, parents, educators. College Admissions Success: Karen Dillard of KD College Prep will present about navigating admissions and the SAT/ACT. Very informative session. Great for 8th-11th graders and parents. Parent Voices. A panel of experienced GT parents offer advice about navigating course options available for middle school and high school. Gifted 101 with Cindy Garcia, GT Specialist, Silver Lake. Your child is gifted — now what? Learn the GT lingo and get strategies for parenting your unique child from a gifted teacher and parent. Conversations for College & Career with Julie Leslie, GCISD Director of Advanced Academics. This session could also be called “What I’d Learn if I Were A Fly on the Wall in Julie Leslie’s House When She Coached Her Own Teenager.” As a trusted HS English and ISM teacher in Frisco ISD, Julie Leslie had many conversations with teens as they anguished over what to major in and where to attend college. Hear practical ideas and exercises that help guide conversations for high ability teens and their parents. These ideas might also help kids ascertain electives to choose in high school. College Admissions Success: (repeated session) Karen Dillard of KD College Prep will present about navigating admissions and the SAT/ACT. Very informative session. Great for 8th-11th graders and parents. Gifted Plus/2e/Twice-Exceptional. A roundtable about students who are gifted and have additional learning difference such as ADHD, dyslexia, and more. Share information and connect with a broader network of families with similar challenges. NEW! Session for K-4th Kids During the Conference. NuMinds Enrichment Workshop: Turkeys Can Fly! FREE and open to SAGE Member Families only. Log into your My School Anywhere SAGE Portal and click on signups to see if any spots are left. The Kids’ Workshop will be concurrent with the keynote and breakout sessions. Kids will first play games and socialize with friends new and old; then the NuMinds workshop will feature the science of aeronautics and flight: Our conniving turkey friend Tom has a ton of helpers getting him over the massive farm wall, but they overlooked a key part of the plan — getting back down! Tom has been plumped up and unlike his wild counterparts, can’t fly. Help Tom get to the ground safely by making a glider, a parachute, or another fantastical flying device! Unlock the secrets of aerodynamics and help Tom learn to “fall with style” at this unique one-time challenge. Required: Pre-Registration for the NuMinds Kids Workshop opens Oct. 29 via MySchoolAnywhere. We will email SAGE Members and post a link on social media. If you have a friend who hasn’t joined SAGE yet — invite them to join SAGE today and attend Gifted Pathways FREE! Thank you to the many people who made Gifted Pathways 2018 possible! SAGE is honored as TAGT’s State Parent Group of the Gifted!